department stores and drug stores nationwide. your basic red in a not-so-usual elegant shade. to compliment this season's hottest colors and trends. try MOSS, a deep-green shade with a hint of frost. Don't forget to apply a coat of Caronia's Nail Hardener and Base Coat (a personal fave of mine!) 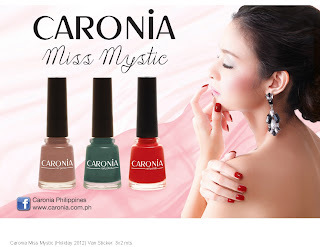 before applying your preferred shade to fill out ridges and protect your nails and top it off with Caronia Fast-Dry Top Coat and a drop of their award winning Kwik Dry and Cuticle Conditioner.